The rental market continues to be heat up with the national rental vacancy rate dropping to a 20 year low. 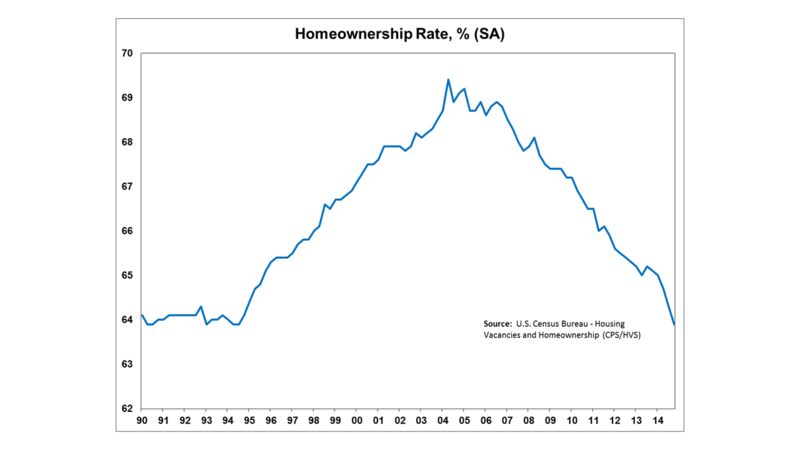 At the same time, the homeownership rate continues to fall and is now at a low point not seen since the third quarter of 1994. The current first-time buyers share is 29% and remains well below the historical average of 40%.This as well as tight lending conditions partially explain the steady decline in the homeownership rate. Rising rents and tight rental market supply suggests that household formation is picking up. With continued improvement in the labor markets these new households will likely transition from renting to homeownership at some point in the future. According to the Census Bureau’s quarterly survey, the rental vacancy rate dropped 40 basis points from last quarter and is down 120 basis points from one year ago to 7.0%. 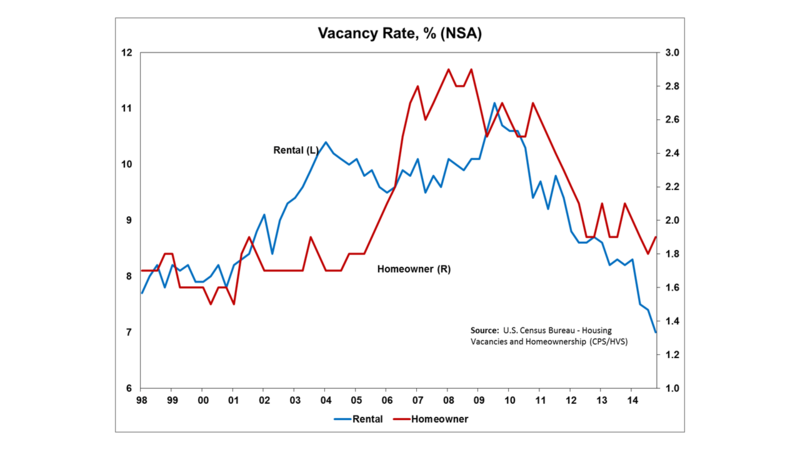 The vacancy rate has not been this low since the fourth quarter of 1993. The homeowner vacancy rate also remains relatively low but did increase slightly from last quarter. The current reading is 1.9% or 10 basis points above last quarter and 20 basis points below the fourth quarter of 2013. The seasonally adjusted homeownership rate continued to fall. The fourth quarter reading of 63.9% remains below the historical 20-year average of 66.9%.